The Northern Lights Will Be Visible Over the U.S. Tonight. Here's How You Can See Them. For the second night in a row, the northern lights may creep down into skies above the United States on Sunday. The Space Weather Prediction Center (SWPC) has issued a G1 geomagnetic storm warning, meaning the aurora could be visible in some areas. 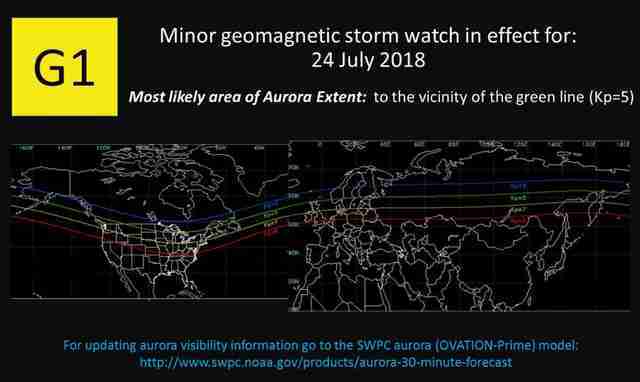 Over the weekend, the SWPC issued a G3 warning, which meant the aurora had the potential to be seen as far south as South Dakota, Iowa, northern Illinois, New York, and Washington state. Around 6:15pm Sunday night, the SWPC extended the warning through Monday morning, but the zone where the aurora might be seen will not be quite so far south Sunday night. The green line on the below map from a previous G1 event shows the range where you should be on the lookout for the northern lights if you're fortunate enough to have clear skies. The area includes parts of Montana, North Dakota, Minnesota, Wisconsin, Michigan, and Maine. (And, of course, Alaska, but an appearance from the aurora borealis isn't that uncommon in Alaska.) In Canada, you'll be inside that zone if you're in British Columbia, Alberta, Saskatchewan, Manitoba, and northern provinces, as well as most of Ontario and Quebec. The SWPC's 3-Day Aurora Forecast shows the best opportunity to catch the show will be August 27 between 1am and 4am EST. To see the northern lights, you'll want to get far from the light pollution of urban centers. National parks and state parks are generally a good place to start looking. 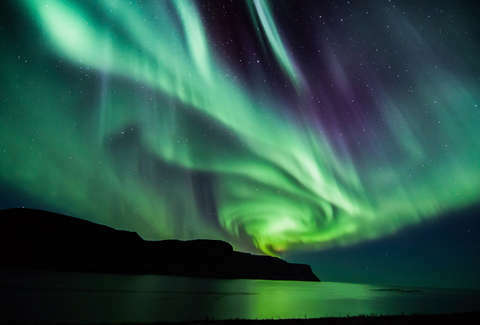 Speaking on how to catch the northern lights, an SWPC representative previously told Thrillist, "You need very clear skies, a good view of the northern horizon (no tree, buildings, or hills), and it needs to be dark." While the night before would have been a great time to be out, Sunday night into Monday morning is a good opportunity as well. With the solar cycle currently near solar minimum, these opportunities won't come up all too frequently. Though, if you miss it, flights to Iceland in the fall and winter are crazy cheap right now.